UPDATE: Support for T-Mobile Wi-Fi Calling seemed unlikely given Motorola’s statement below, but now the company has confirmed that the Moto Z will not support Wi-Fi Calling on T-Mo. After debuting in June, the unlocked Moto Z is finally available for pre-order. Motorola is now accepting pre-orders for the unlocked GSM version of the Moto Z. As of this writing, the Moto Z’s estimated delivery date is September 30. This Moto Z is similar to the one that launched at Verizon in July, but without any sort of Verizon branding. It supports Moto Mods, which are modules that magnetically attach to the back of the device. There are simple back shell pieces made of nylon, wood, and leather for $19.99, Power Packs with added battery power from $59.99, a JBL SoundBoost speaker for $79.99, an Insta-Share Projector for $299.99, and a Hasselblad True Zoom camera module that’s available for pre-order for $299.99. When it comes to raw specs, the Moto Z is running Android 6.0.1 on a 5.5-inch 2560×1440 AMOLED display. It’s got 13-megapixel rear and 5-megapixel front cameras, a Snapdragon 820 processor, 4GB of RAM, 64GB of storage, a microSD slot for adding up to 2TB more storage, and a 2600mAh battery. There’s also a fingerprint reader below the Moto Z’s display. The Moto Z has just about every feature that you’d expect for a flagship in 2016, but it’s also facing some stiff competition in the form of the Galaxy Note 7, iPhone 7 Plus, and LG V20. Plus, those phones are being sold by T-Mobile, so they can be purchased with EIP or JUMP! On Demand. It is nice to have the option of getting an unlocked Moto Z in the US, though, and if you’re feeling the Z and its Moto Mods, you can now get one of your very own. $700 for a phone w/a 5.5″ screen & a 2600 mAh battery. WOW, as tempting as this may be, I think I’ll pass…..
Yeah and no headphone jack either, because the phone has to be as thin as possible. I’m not hating on Motorola, all the mfgs have their strong points & an equal amount of WTF. An “A” for effort, but, seriously, real world one-day battery life shouldn’t be an option. If the pricing was a bit lower, perhaps, but, even then, how practical is it to have the mod options available/on your person most of the time? No thanks, just build the features into the phone…… Or, have a real MotoMaker, with the options you want,beyond the skin-deep variety & built to order. I’m disappointed with the cam. Was hoping it would compete with the S7/Note 7 but Samsung has this category down. Does this mean the Moto X is dead? 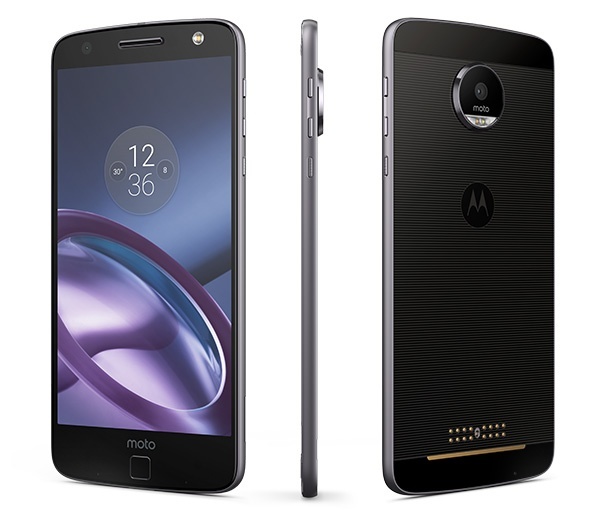 Nothing slotted between Moto G and Moto Z? The Moto Z line of phones replaced the Moto X. No thank you. I think Moto (Levono) should be pricing this phone much more competitively. At no more than $450, if you are not going to include it through a carrier plan like AT&T or T-Mobile. Besides, all Moto products have received signifcant price drops within a months after launch. Which further devalues their $700 (!?!) asking price. without a headphone jack, i wouldn’t pay $4.50 for one. I have to wait for a B66 phone, but when those arrive I’ll have to wait for the 600Mhz and high frequency phones, and those should also be fully compatible with Verizon and AT&T. It doesn’t have a headphone jack. Tell that to the record breaking sales of the iPhone 7. Apple loyalists are a special class. These are the same people that were told “you’re holding it wrong” as an excuse for a defective product, and not only bought the excuse, but defended it. Yup! And they screwed the Moto X Pure uses on T-Mobile/MetroPCS by introducing a busted VoLTE patch that causes audio studdering in VoLTE calls and won’t fix the issue. It’s been Since January! Moto(Lenovo) is off my list of phone options. Awesome device but the price is what is keeping me from purchasing it. Sure it’s par up with mainstream flagship phones and attractive, but not $699 nice. Rather pay bit more for a Galaxy note 7. It’s almost impossible to even consider this for $700 when the Axon 7 is under $400. I like the phone, but It’s way over priced. Considering that if an individual decided to buy one, they would have to also purchase a Moto mod, which some of them are expensive. What’s with this sudden wave of devices that support VoLTE on TMO, but not WiFi calling? After all the effort Google went through to try and build it into android…. They didn’t pay t-mobile for permission. The phone probably DOES support wifi calling, just not with a t-mobile number. No wifi calling, No thanks. I preordered mine and got 5% off and 0.0% for 18 months on my Moto Credit Card. Replacing my Moto X 2nd Gen.
Why? Stock Android. I handled a lot of phone daily and I can’t bare going back to a skinned version of Android. Also, I’m addicted to Moto Actions. Finally, I saw that Moto has pushed monthlies on the Z so far. Why not OnePlus3 or Axion7? No 0.0%, lousy tech support, and Skins! I was considering the V20 despite the Skin until I saw the $800 price rumors. I should have the phone by next Friday. I’m not sure if that says something positive about the iphone 7, or just points to the overall terrible selection of phones that t-mobile currently offers. It doesn’t say anything about anyone but me. I’ve had Android since the G1 (still have it and an S7 Edge) and I wanted to try an iPhone. I don’t regret that decision. Regardless, T-Mobile’s lineup is virtually the same as the other major carriers. Where are the Nexus phones? Where are the band 12 HTC phones? Why are they STILL selling phones that ship with lollipop (and will never get marshmallow)? Why do all of their phones fall into 2 distinct prices ranges: under-$199, and over-$500? Right now, if you walk into a t-mobile store, your options for non-garbage phones are Apple, Samsung or LG, and that’s it. Inexcusable. Ridiculous. Basically, they couldn’t be bothered to offer a basic feature from the third major carrier in the US? No wonder they laid off 50% of their staff today. The executives keep making stupid decisions. I feel bad for those workers. The Play is the interesting one, but lack of wi-fi calling puts it down the list for sure. I thought it was baked into android now anyways. We have poor cell phone reception in the house here. Struggled for years with ATT. Finally solved the problem after switching to T-mobile due to wifi calling in the home. The T-mobile phones automatically switch to wifi calling at home, so it is mostly seamless. I would like to buy a new phone, but wifi calling is a requirement.